Yesterday saw yet another 2012 milestone marked: 1,000 days to the Paralympic Games. 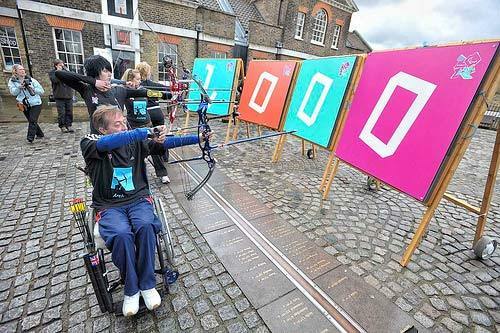 Mike King was there to capture arrows being symbolically aimed across the meridian line at Greenwich towards some big neon numbers. Not quite as dramatic as fireworks over BT Tower but there's an exciting fact to reveal - if you have an impairment, there's still time for you to be considered as a Paralympian, as Visit London reports. Of course, if it's now less than a 1,000 days to the Paralympics beginning, it's less than a 1,000 days to the closing of the Olympic Games and handover of that big flag to Rio.